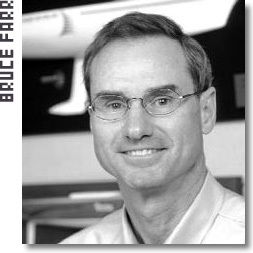 No discussion of a Farr boat can avoid some discussion on Bruce Farr (O.B.E.) himself. Certainly I am out of my depth, and at a loss for words, when it comes to discussing this great man, clearly one of the most successful designers of performance yachts ever. 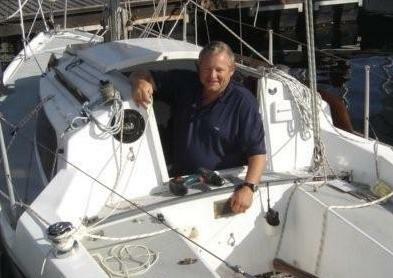 Born in Auckland in 1949, Bruce was an accomplished and keen Dinghy sailor. By his late teens he was designing and building very fast dinghies. By his early 20s he had a number of fast and light keelboats to his name. 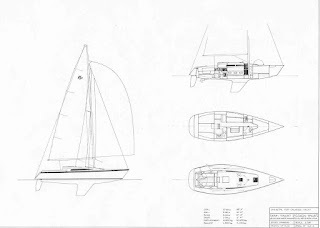 The Farr 38/40 reviewed here was drawn in 1978 - Bruce will have been 29 years of age. A quick glance at the design list on www.farrdesign.com left me in a slight state of shock. There are literally hundreds of designs (I didn't have time to count them all) - but so many big name boats I hadn't known were his. For example Ceramco (early Whitbread maxi), the new Farr 40s, Transpac 52s, Mumm 36s, some of the super Maxis eg Mirabella and the big Wallys, many of the lead Volvo 70s, half a doxen Open 60s and Whitbread 60s - it goes on and on and on). Did I mention the America's Cup yacht KZ-1, many of the recent Bavarias and Beneteaus? Anyway, the Farr 38/40 sits right in the middle of the list as a small "performance cruiser" if you don't mind! I had a good chuckle when I read the brochure, describing this as unashamedly a cruiser! See http://www.farrdesign.com/pdfs/172brochure.pdf if you don't believe me! Its an instructive read. Felt like I was laughing in church! Where I come from this is quite a mean machine. They go like hell, are capable of winning anything in our club classes and occasionally even line-honours amongst some large modern thoroughbreds. 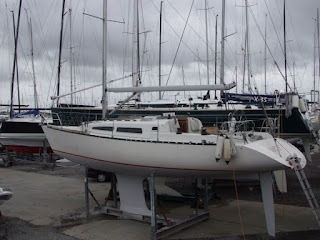 The local Farr 38/40 "Al" has been well campaigned and just proves the performance credentials of this design. As for a cruiser? - well think of taking the family on holiday in a four-seater Ferrari, instead of the Volvo this year. HBYC's Faraway in fresh conditions off Hout Bay beach. HBYC's Faraway in light conditions under Chapmans Peak. 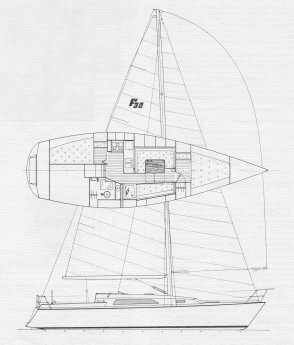 Farr 38/40 Sailplan and Layout. Click for fullsize. As a designer, Farr stands out as someone who really made the case for light boats, and safe, seaworthy, light boats at that. The yachting world was really quite shocked when his designs first appeared - refusing to believe that such relatively light boats could be seaworthy. I wouldn't say he was the first - even van der Stadt was doing this - but nobody popularised the case better than Farr. 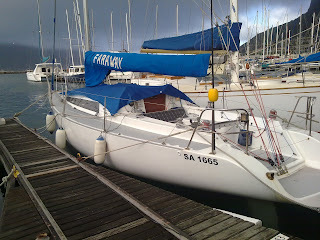 The other thing Farr seems to excel in is optimising the proprtions and dimensions of a boat for a given race or task. Ceramco (68') was such a yacht - skippered by Sir Peter Blake in the 81/82 RTW Whitbread Race. It weighed about 2/3 that of its main competitor, Flyer-2 76' (S&S, Conny van Rietschoten), yet they sailed almost within sight of each other around the world. But for an unfortunate dismasting on the last leg I think, Ceramco would have clearly won . . .
and the 2' sugar scoop on this one. Back to the Farr 38/40. Unlike many of the others in this blog, Bruce Farr is not a South African designer (we make a very special case for Kiwis though!). However this design has been very popular here, as a very good offshore-racer, club-racer and class-racer. They are seldom campaigned under IRC as the ratings are just too punitive - as this class was designed in a conscious departure from any rating systems. 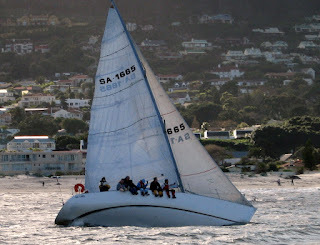 You will note this class is often referred to as the Farr 38 (40) class. The original design is for a 38 footer, and the 40s have an extended sugar-scoop stern - presumably for downwind racing. The example I am most familiar with - viz. HBYC's "Faraway" has recorded consistent speeds at around 17 knots for extended periods on the Cape to Rio race - so clearly they can plane well. Notably, this boat was rolled 360 degrees by a large breaking wave near Saldnaha Bay on the return from Rio - it righted promptly, with only a broken vang, and a fair bit of mess down below! "Faraway" - above - has tiller steering, running backstays, the sugar scoop extension, no lazy-jacks, and generally no roller furling. In my humble opinion, she is dam hard work, and the owner skipper - Chris Sutton, a hardy and wild old 72-year old (also our ever popular Commodore) show no sign of repenting on these matters, as long as he can muster 6-8 crew! This is not a good example for shorthanding, and single-handing is totally unthinkable. In truth - this is not actually what Farr intended. 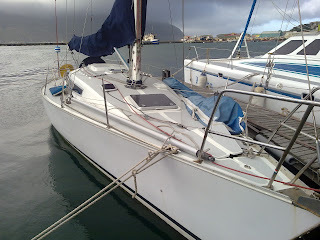 With suitable rigging, she would be dead easy to sail shorthanded, as indeed some are. She also sails beautifully under main alone. I am not sure whether she was originall drawn with a tiller or a wheel - both examples are common here - but certainly the tiller is great, and she sails like a dream. 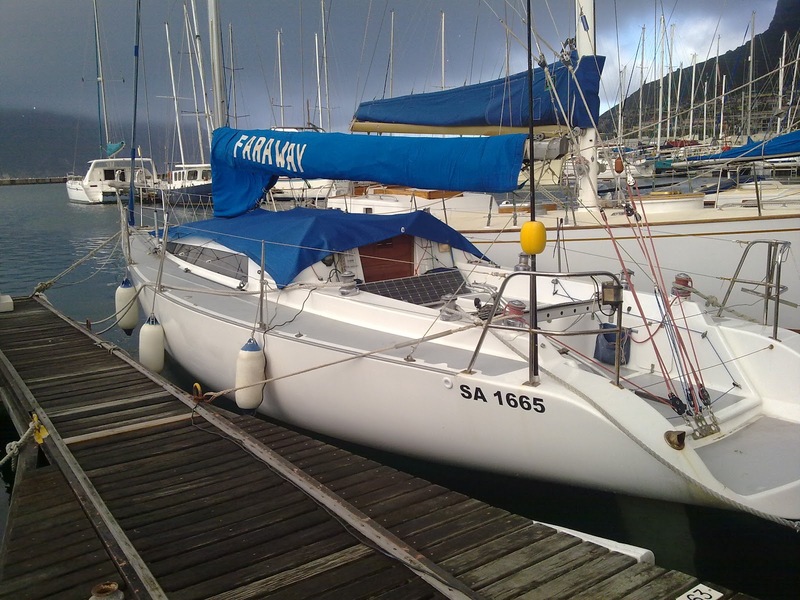 In the rough conditions around Cape Town (not to mention Hout Bay's own horrific squalls), she is safe and quite forgiving, and always fast. In light airs she is also very impressive. This truly is a safe all-weather boat. The cockpit is ample and well suited to a busy racing crew, while also nice for cruising. The open stern and sugar scoop make boarding exceptionall easy. The accommodations are really basic on this example, but in many cases are very comfortable and well fitted below. Not huge for a 38 footer below - but certainly acceptable for a long downwind race. . . .
a racer, so no lazy-kacks and roller furling either. Clean deck lines on Hocus-Pocus. 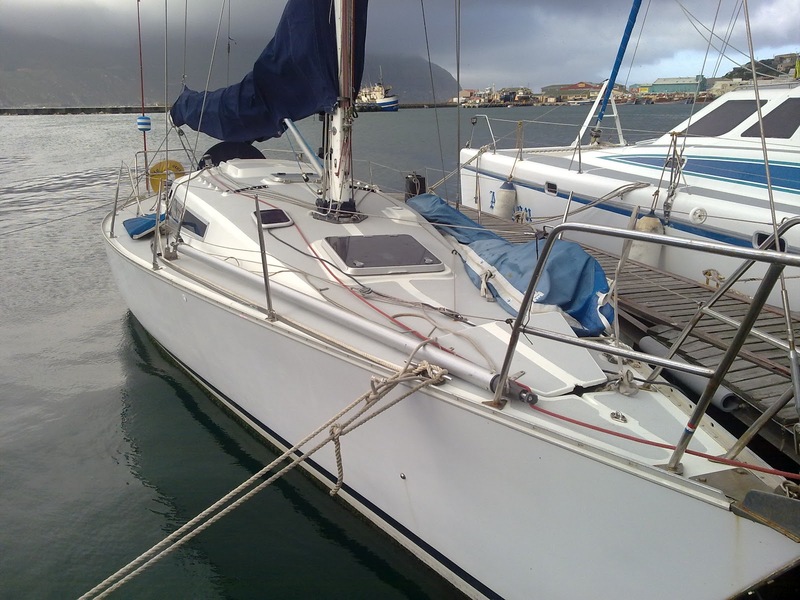 The Farr 11.6 metre (38 ft) fast cruising sloop continues to gain popularity around the world. At present there are 85 boats sailing in 8 countries. 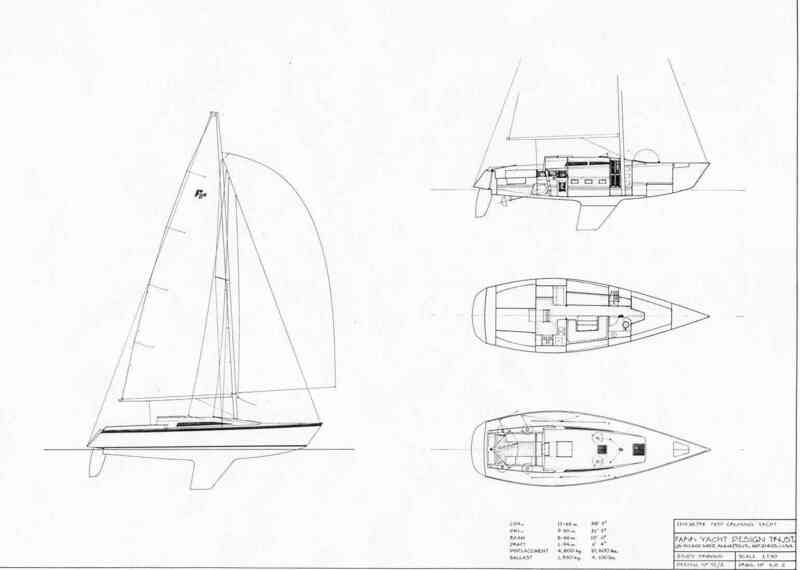 Designed in 1978, the yacht was inspired by a trend away from the IOR Rule restrictions towards a 'pure' design concept to produce a fast, comfortable, easily handled and relatively economical yacht. Changes to the IOR Rule in 1977 and 78 were obsoleting yachts the year following their launching as well as distorting hull shapes. It was time to look toward the one-design concept that offered security of invenstment and pleasureable sailing. The Farr 11.6 metre has achieved these aims. It does not rate very favourably under IOR - but it was never intended to. It is simply a very fast cruising boat but will race boat for boat with the best of the 2 tonners. In general terms, the style is for a light (ish) displacement hull form, moderate beam by modern standards with powerful sections, a wide stern and fin bow. The powerful hull coupled with a good percentage of ballast set low in a high aspect keel with fine bow sections makes the boat stiff and ensures excellent performances to windward (particularly in rough water). This rig is non-masthead swept spreader arrangement with no complicated runners. 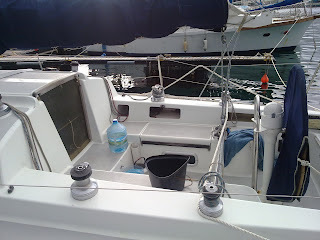 It has easy to handle headsails and a mainsail large enough to drive the boat by itself for 'nonchalant' cruising. The boat has a high sail area-to-displacement ratio to ensure downwind speed. The interior design is definitely cruising oriented. It features wide safe companionway steps, 2 or 3 double berths, big galley with fridge and freezer, separate navigation area, separate head and shower. There is an abundance of storage space in the main cabin area and in the wide stern. The boat can cater comfortable for up to 9 people. 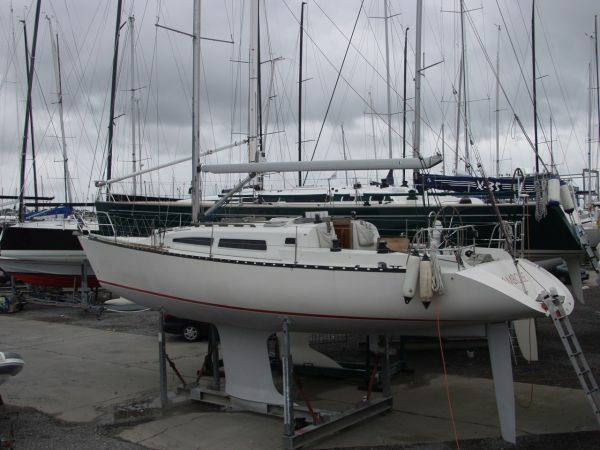 Initially the boat was designed for 2 Auckland yachtsmen who previously had owned and competitively sailed one of Bruce Farr's first cruising yachts, and who wanted a fast cruiser/racer to compete in 2nd division Royal New Zealand Yacht Squadron series. The first wooden boat, GOLDEN EAGLE, was launched in January 1979. By that time some 16 wooden boat plans had been sold and production for a one-design class yacht was underway in New Zealand and Australia, the first glass boat being launched in Auckland in August 1979. 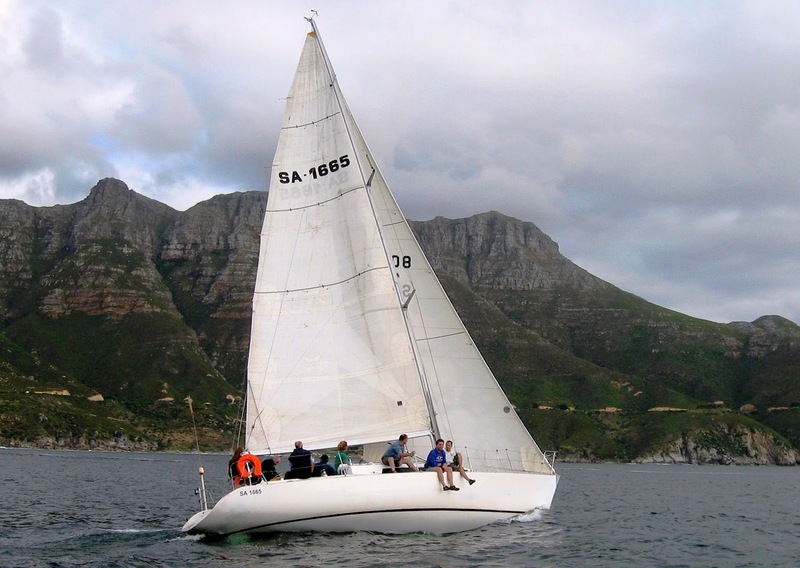 The Farr 11.6 metre was adopted by the Royal New Zealand Yacht Squadron as a class for one design racing. Hightly competitive racing has developed in New Zealand and Australia with yachtsmen crossing the Tasman to compete in events. Owners Associations formed in both countries control class restrictions and racing.